Our deeply rooted beliefs and assumptions shape our views of the world, decisions we make, and actions we take. They vary greatly from individual to individual based on when, where, and how one grew up, among many other factors. In this post, I’ll describe how these assumptions can affect the voice individuals have in society by using examples primarily from the graphic novel Abina and the Important Men  and the film The Gods Must Be Crazy . I relate it to Amartya Sen’s notion that a complete conception of development must also encompass factors pertaining to an individual’s rights and freedoms, rather than solely economic factors as has often been done traditionally. Sen  claims that, “the gap between the two perspectives (that is, between an exclusive concentration on economic wealth and a broader focus on the lives we can lead) is a major issue in conceptualizing development." I will argue that the voice people in a society have—particularly those who don’t hold a great deal of political or economic power—should be a factor taken into account when assessing the progress of a country’s development. I use the term voice to encompass two ideas: one’s ability to speak freely and openly with individuals or groups from all classes of society to express thoughts or opinions; and the ability to not only be heard but also listened to, particularly by those individuals who are considered the “important” people in a society. Abina and the Important Men is a graphic novel based on transcripts from the court case of a young girl who escaped enslavement in the Gold Coast region of Africa in the late 19th century. After running away, she convinced James Davis, a local man who spoke her language that regularly assisted with translation in the courtroom, to help her hold a trial against her former master. Davis discussed with the local acting judge, William Melton, about setting up a trial for the girl. He convinced Melton by appealing to his sense of righteousness and desire to uphold Britain's legal outlawing of slavery in the colony. This graphic story portrays the struggle of a young woman trying to exercise her legal rights in a society where those in power have a definition of slavery that portrays it as a common and rather trivial system. It highlights the major role that different people's deeply-rooted assumptions about culture and society play in a case like Abina’s, and focuses on her struggle to find a voice in a world constantly trying to silence people like her. The Gods Must Be Crazy takes place in Botswana within a few decades of the country gaining independence from the British in 1966. It tells the story of a bushman, Xi, from deep within the Kalahari who embarks on a journey to get rid of a mysterious evil object that fell from the sky. This object, a glass Coca-Cola bottle, has stirred up previously non-existent feelings like anger and jealousy among the members of his clan. He hopes to halt these negative intrusions on his group’s previously pleasant relationships. During his journey, he encounters many new people unlike anyone he's ever seen before, including a young British man working on a doctoral thesis in the desert, and his assistant, a local man who can speak both English and the language of Xi’s clan. Narration throughout the film is used mostly to express what the bushman is supposedly thinking, translate what he's said, or explain why he takes certain actions or misunderstands others' actions. There are relatively few points in the film where we hear Xi’s speech or actions translated directly by the researcher's assistant, the only person who seems to understand the culture he comes from. This story, much like Abina’s, focuses primarily on a character with a voice greatly influenced by others. In conjunction, these two pieces highlight how a person's status relative to those in power generally reflects the kind of voice he or she has in society. Those who are important and have power tend to have platforms to express their voices more loudly (i.e., more publicly) than others who are not considered so. They also typically have resources and support from other powerful people to easily quiet anyone who hinders their ability to reach their goals or fulfill their desires. We often see this quieting of voices by the powerful even in places that are considered highly developed by conventional definition because they’re economically and financially successful. But using Sen’s definition of development, a major part of the equation is still missing. If a majority of the people in an economically successful place have absolutely no voice in the society they live in, can we really say that it is developed? More than just the important people need to have a say in processes, initiatives, and changes that affect the evolution and development of a country. "Will any of these people be like me?" "Do you mean girls? No. To be a member of the jury, you must speak English well, you must own land or have money, and above all you must be a man." Along the same lines, those portrayed as important people in The Gods Must Be Crazy are the comparatively rich, white men. For example, during the movie’s climax, Xi cunningly saves a huge group of children and their teacher from a band of local rebels that have taken them hostage. By disguising himself and pricking each of the rebels with a mini arrow dipped in tranquilizing solution, he gets all of the rebels to fall sleep and the children escape. The doctoral student, a non-local white man, has planned the scheme to save the children with his assistant, a local man, and carries it out with the help of Xi and the schoolteacher. But the credit for saving everyone is initially given to a different rich white man who just happens to show up to the scene at the right time. The researcher is disappointed because he feels like he should get all the credit. The contributions of the assistant, bushman, and schoolteacher are barely acknowledged by anyone, let alone celebrated as heroic like the researcher's, even though the plan wouldn't have worked at all without their help. They all had crucial roles in the mission but hardly any voice throughout the process. The film makes it seem like they aren’t important enough to have opinions worth acknowledging or actions worth commending. A recurring theme throughout both the graphic novel and the film is the idea that people’s assumptions about the world have a tremendous influence on their thoughts, opinions, and actions, as well as their interpretations of others’ thoughts, opinions, and actions. The portrayal of Xi in The Gods Must Be Crazy highlights this fact. Xi lives in Botswana, where “freedom of speech remains much prized” and there are many democratic practices such as tribal meetings where "everyone from the chief to the village idiot is allowed to speak his mind, without fear or favour.”  While one may not think of Xi as being unfree (to use Sen’s term) necessarily, he is constrained throughout the film because of his lack of ability to communicate with people he encounters outside his familial group. The ways in which the research assistant acts as his translator and the narrator frequently operates as the voice of him for the wider audience throughout the film illuminates how all of Xi’s thoughts and actions must be explained through language based on a set of assumptions held by the target audience, which likely comprises primarily Western, English-speaking people. Xi’s conceptualization of his actions throughout the film would presumably be expressed very differently in his language and culture than they were presented in the dialogue of the film. Don’t get me wrong; it’s important to acknowledge that language like this must be used in a film where the primary goal is to entertain the audience. This type of translation is necessary to tell the story more completely to people who may be unfamiliar with Xi’s culture. In fact, much of the humor throughout derives from the misunderstandings that occur between Xi and the other characters. My point in discussing this example is primarily to illustrate how greatly our assumptions and others’ differing assumptions can shape our social interactions and determine the avenue through which we are able to communicate with and understand each other. The problem, then, is not that these people want to make decisions for others of different social groups per se. Rather, it’s that they consistently make decisions without consulting all of the people who deserve to have a voice in the process—namely, those who will be directly affected and can give insight into how decisions, schemes, or proposed solutions to issues in development will affect their everyday lives. Those whose voices are quieted or nonexistent are never given the chance to articulate their opinions based on their deeply rooted assumptions, or to explain these assumptions so those making decisions may understand their logic and ways of thinking better. Case studies such as Oxfam’s survey of development project processes in Bolivia and Peru  demonstrate how obtaining free, prior, and informed consent from affected local indigenous peoples or communities before undertaking projects is highly beneficial. It can help sponsors identify potential problems or previously unconsidered opportunities early on and adjust their plans accordingly. However, the more common approach seems to be along the lines of how the Botswana government handled the diamond company DeBeer’s request to explore local lands for diamond mining in 2002 , in which indigenous Kalahari bushmen were completely removed from their land with little explanation and no warning, despite claims from the community that many members would “even be willing to work in the mines—anything, they say, so long as they can stay.” Historically it’s been much more like this—development project sponsors never consult the local communities before undergoing projects. Often, those without economic or political power are silenced because, like in Abina’s story, powerful people fear that if one person is suddenly freed and given a voice then everyone else like them will suddenly get louder and perhaps strip away some the important men’s power or interfere with their goals for change and development. The jury in Abina’s trial decided that they could never bring a charge against her master and grant her victory, for fear of chaos ensuing that might alienate the slave owners and halt the country’s modernization or rapidly developing economy. Using Sen’s definition of freedom, this is actually a sort of anti-development or step backwards from modernization, in that freedom is neither a means nor an end in development for these repressed individuals. How could a country be considered more modern if there are still enslaved segments of the population like Abina, who indirectly expressed her definition of slavery by stating, “I had no will of my own and could not look after my body and health”? She appears to have no voice to use as a means to gain her definition of freedom. Abina Mansah illustrates how, despite the fact that she’s escaped from her slave master and won’t be forced to return, she still doesn’t feel free because “it was never just about being safe. It was about being heard...But now I know that nobody heard me. Now I know that I might as well have kept silent.” Abina’s definition of freedom was clearly different from that of the magistrate and jury members’. The judge in Abina’s trial and the white men who interacted with Xi throughout The Gods Must Be Crazy exemplify how powerful people’s perceived understanding of others’ assumptions is often incomplete or wrong, even though they sometimes think otherwise. This leads them to silence those beneath them in society because they feel that their assumptions are better and more correct, and therefore this gives them the right to make decisions and impose things upon local communities or individuals without their consent. People having a voice in society is a critical part of them being free, and in turn a critical part of the development of a country. The idea of freedom is often brushed off or unaddressed in development literature because it may be seen as less important or not as directly related to indicators of development as things like GDP or other economic measures that can be quantified more precisely. However, the gap between the focus on economic wealth and people’s well being must be narrowed to provide a more well-rounded definition of development. Ensuring that all members of a society have a voice in how their country evolves, particularly when it affects their living and working spaces directly, is true development. It can help quell violent disputes and oppressive systems such as slavery that arise when this is not done, and enables societies to ensure a better quality of life for all of their people. 1. Getz, Trevor R. and Clarke, Liz. 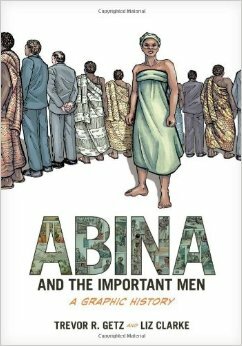 (2012) Abina and the Important Men: A Graphic History, New York, NY: Oxford University Press. 2. The Gods Must Be Crazy. Dir. Jamie Uys. Perf. Marius Weyers, Sandra Prinsloo, and N!xau. C.A.T. Films, 1980. Film. 3. Sen, Amartya K. (1999) Development as Freedom, New York, NY: Anchor Books. 4. Delingpole, James. “Diamond Geezers” in The Spectator. London: June 2, 2001. Vol. 286, pg. 20-22. 5. Greenspan, Emily, (2012) “From Controversy to Consensus? Lessons learned from government and company consultations with indigenous organizations in Peru and Bolivia,” Oxfam America Research Backgrounder series. 6. Price T. “Exiles of the Kalahari,” in Mother Jones. Jan/Feb 2005. pg. 30-35. 7. Sen, Amartya K. (2001) “What is Development About?,” in Gerald M. Meier and Joseph E. Stiglitz, Frontiers of Development Economics, Washington DC: IDRB, p. 65.